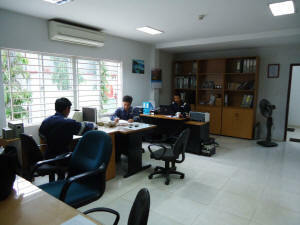 Our company was established on Dec. 1999 with the aim to supply Equipments & Services to Marine, Oil Rigs and Industries. Our customers are Local Shipping Company, Foreign Vessels calling Vietnamese ports, Petroleum Companies, Offshore Platforms and Gas Processing Factories. Our stock is also available with more than 200 products that are ready to deliver for customer's need. The after sale service is back up by company's personnel which is supported by equipment Manufacturer. Annual Inspection for Inflatable Lifejacket. Inspection & Air Pressure Test for Immersion Suits. Our Service Station is audited and approved by VR, ABS, BV, DNV, GL, KR, NK, LLOYD'S, RS.